do hereby make this my ”Last Will and Testament”, hereby revoking all wills and codicils heretofore by me made. Article 4. One year after my death my son Julius Adam shall pay to each one of his sisters or surviving children Twenty Dollars and every succeeding year he shall pay the same amount until each of his sisters, or surviving children, shall have received Two hundred Dollars, and all of his payments amount to One Thousand Dollars. Article 5. If the aforesaid payments are punctually and promptly made by my son Julius Adam, then he shall pay no interest during the ten years upon any of this money. Article 6. In case my son Julius Adam should die his wife Ida Adam, nee Hauffler, [sic] shall fill his place as far as this will is concerned as long as she remains unmarried, but should she marry again after the death of my son Julius Adam, then and in that case I hereby direct that said homestead, described in Article 1 of this will shall be owned by my son’s surviving children under the condition that each of my daughters receive their Two hundred dollars out of this my homestead in annual payments of Twenty Dollars each as heretofore directed. Article 7. I appoint my son Julius Adam the Executor of this my last Will and Testament. Article 8. I hereby direct that no other action shall be had in the Probate court in regard to the settlement of my Estate than the probating and registration of this will. Article 9. I direct that my Executor shall not be required to give bond. 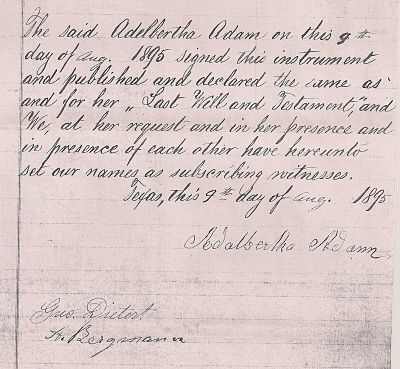 The said Adelbertha Adam on this 9th day of Aug. 1895 signed this instrument and published and declared the same as and for her “Last Will and Testament,” and We, at her request and in her presence and in presence of each other have hereunto set our names as subscribing witnesses. Texas. Kendall County. Probate Minutes. Office of County Clerk. Boerne.